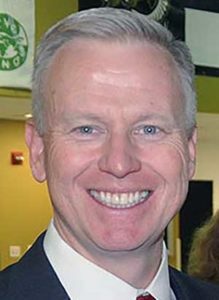 Arapahoe County District Attorney George Brauchler wants to be the Republican nominee for Attorney General, which would be fine if he wasn’t such an absolute disaster as a district attorney. Brauchler screws up high-profile cases on the regular, and he has a miraculous ability to turn relatively-minor issues into major stories. A Colorado prosecutor says that a Mennonite woman who has been jailed for refusing to testify in an execution case because of her religious beliefs wants to be a “martyr” for the anti-death penalty movement. “This is somebody who is trying to defeat the system,” Arapahoe County District Attorney George Brauchler told NBC News on Thursday. Greta Lindecrantz, a private investigator for defense attorneys, was subpoenaed by the DA to discuss the work she did in the case of Robert Ray, who is blaming his legal team for his conviction and death sentence. Brauchler says that Lindecrantz wants to be a “martyr” for the death penalty, and she certainly is now — thanks to Brauchler. Does Brauchler truly not understand the role he has played in this? And is he really so blindly attached to the death penalty that he doesn’t recognize the absurdity of a Republican fighting against religious freedom? This is a terrible look for a guy trying to find support from the Republican base after a spectacular flame-out as a candidate for Governor. Lindecrantz would be out free and walking the streets today if she had had the good fortune to have Brauchler prosecute her for a crime . . .
That's pretty harsh for someone who wants to be Attorney General. She wouldn't be walking the streets … she'd be tending to her sick husband. Mennonite religious freedom isn't real Amur'kan religious freedom. You can tell because she doesn't want this criminal to receive the justice of death. The contempt sentence was handed down by the judge, not Brauchler. As in all such cases, the offending party has the keys to the jailhouse door and can purge herself of contempt simply by following the order of the court. Would we be shedding so many tears if the woman in the hoosegow was a right to life stalwart refusing to testify against Robert Dear? I have to wonder how her faith journey led her to defend a scumbag. That must have been an interesting convolution of her values. She probably doesn't want to speak for fear of incriminating herself. Brauchler is pushing it, though. See my post below, but I fail to see how this appeal is so borderline that it rests on Lindencrantz's testimony. District Attorney George Brauchler, whose office sought the death penalty in the case, called Lindecrantz’s actions an anti-death penalty stunt. "Gamesmanship." Really? That's how he treats religious objections? Brauchler knows “gamesmanship” . . .
. . . every death-penalty case he pursues is personal political gamesmanship. I'm struggling to understand this situation… could someone fill in some blanks? Lindenkrantz was a _____ (researcher, expert in something… ?) for the defense in this case? I got the impression she wasn't one of the defense attorneys, who have already testified. And the available evidence and testimony are insufficient without Lindencrantz because _____? Are you seriously suggesting, PR, that Brauchler is the only prosecutor in America with contempt powers? Or do you concede that Lindecrantz was jailed for defying orders of the court? Your questions might be reasonable if you addressed them to the judge. But until further notice, I am assuming the judge is justified in holding a person who defies the orders of the court in contempt. Lindenkrantz was an investigator hired by Ray's defense counsel. Ray is trying to get a new trial based on ineffective assistance of counsel. SCOTUS has held that the Sixth Amendment right to assistance of counsel in criminal cases includes a right of effective assistance. As the doctrine has developed, the bar for what qualifies as constitutionally "effective" is quite low. To get a new trial, the defendant has to prove to a judge that defense counsel's performance was spectacularly deficient, and that the outcome would have been different but for his lawyer's buffoonish incompetence. There's no such animal as getting a reversal based on ineffective assistance of private investigator, and an investigator's incompetence isn't automatically imputed to the defense lawyer who hired her. However, an investigator’s fuckuppery can be relevant to an ineffective assistance claim if defense counsel knew or had reason to know that the investigator was generally incompetent or was half-assing or otherwise bollixing the investigation in this particular case. That's where Lindenkrantz's testimony comes in. Still, the underlying sentiment is correct. No one should get a religious exemption from complying with generally applicable legal requirements. I'm A-OK that Lindenkrantz is in jail for contempt, and I suspect appears to be A-OK with it as well. Tweety needs to learn when to just stfu and do his job. But that won't happen, since people that stupid generally don't learn lessons. A journalist cannot be complied to testify about sources if there is another way to the truth. There is surely another way to clear the very low hurdle of determining whether or not Lindencrantz was an effective investigator for an apparently effective defense team. That evidence exists in paper (the original trial documents) and in testimony – the defense counsel isn't disputing her reliability or productivity AFAIK. Also, the presumption here is that the facts already on record are true. To succeed on appeal, Ray's lawyers should have a solid case to present to the court that the defense was in fact incompetent. That seems unlikely here; Lindencrantz was paid significant money and is/was a respected investigator with a vested interest in providing solid research – the same religious interest that now compels her to go against the court. I do agree that, having offered public services to perform a job, the same standard applies here as applies to a baker. The way out in both cases is the same: don't do the job. In this case, don't take on a death penalty case. In both cases, civil disobedience is fine, but expect penalties. Lindencrantz would rather sit in jail than uphold a death penalty verdict, at least until the conflict can be resolved. My question, V, was to establish just why such a harsh action was imposed on what seems to be a second-tier figure on a decision that normally has such a low bar to clear and a presumption of competence. Partly, PR, the contempt may stem from this being a death penalty case. Those trigger "super due process" and everybody is afraid of getting slapped on appeal. It's the trial judge's decision as to whether the investigator is in contempt. Given the fact that she repeatly refused a direct order from the court, I don't see that the trial judge had much alternative. Genghis is right, however, in mocking Brauchler for carrying this a bit far in his statements. The contempt power rests with the court, not the da, and brauchler would have been wise to settle for appauding the judge for doing her job. Yessir, ol' George's comments are spectacularly ill-considered even by his preposterously lax standards. It's more than a little mystifying, especially since doing the smart thing is so simple. Vikki Migoya, a spokeswoman for District Attorney George Brauchler, said the office would not comment on Lindecrantz because it usually does not talk outside court about proceedings, especially when many of the filings have been sealed. Easy peasy, and the objectively correct thing to do. I reckon Tweety just doesn't have much going on in the way of self-control. It turns out Lindecrantz was one of four investigators paid $390,000 to dig up stuff to help Ray's defense. It is not clear how much of that sum went to her. She has already done the work. Ray is now claiming the investigators were incompetent because they didn'T find anything to let him beat the rap. She has repeatedly refused to testify about the work she has already done and for which she was well paid. Her religious convictions didn't stop her from working for the defense or cashing some pretty generous checks for her trouble. But she refuses to answer questions that merely confirm that she did what she did. Give me $390,000 and I'll praise her conscience. Otherwise, I'd remind her of the commandment to not bear false witness. She took the money , did the work and now refuses to confirm her activities. Well, she may be a hypocrite, but at least she's a well-paid hypocrite — with your tax dollars. P.S. The reason Lindecrantz's testimony is important is that Ray has specifically claimed she wasn't competent to be an investigator and thus overlooked evidence that could have convinced the jury to spare his life. She was paid to investigate for the defense. She investigated for the defense. All of her reports and all of her invoices are acknowledged to already be in the hands of the court. We'll see on appeal if other judges believe her testimony is crucial to a determination of whether the attorneys provided an adequate defense. Or if they believe the "contempt" charge is warranted, knowing her well-developed objections to cooperating with those pushing to put someone to death, and that there is no indication that the punishment will induce her to change her mind. Nobody is asking her to cooperate with the prosecution. She takes about $100,000 toinvestigate for the defense, and now refuses to confirm that she investigated for the defense. Hell yes, she is a hypocrite. It's not just about whether the lawyers were incompetent. Ray specically charges she was unqualified and incompetent. She doesn't have to say he's guilty, merely outline her activities and qualifications, if any. I want my 100 grand back. I agree. Anybody who does investigative work for a criminal case would expect to testify regarding their findings. It's part of the job description. You do the work and collect your paycheck with the full understanding that you can be called to court to defend your work. Were the results of her investigations documented? Can those documents be easily produced? Her output alone should be sufficient to prove competence at the level required to disprove incompetent defense. It's not your 100 grand asshat. And, by the way, the rates the state pays are way below market. The lawyers get $90/hour for the Ray case. Most experienced criminal defense attorneys in Denver charge at least 4 times that for private cases. So do some homework for a change. Actually, Trumpbreath, it is my $390,000 that went to four investigators — mine and every other taxpayer. I only want $100 grand back because the other three earned their pay. As to homework, Jaredbrain, show me the public defender in Denver who earns $350 an hour. I said most experienced criminal defense attorneys, not public defenders, asshat. Most charge $300+ per hour. Including me. Now are you going to request your tax money back from the prosecutors for being found to have withheld evidence? Or from Brauchler for pursuing death in James Holmes case only to lose it and thereby cost taxpayers millions? Or how about the costs of keeping Lindecrantz jailed? Nah. Didn't think so. You ain't worth it, Trumpbreath. But I will happily chip in to keep Lindecratz in jail. Colorado provides a very good public defender system, but our attorneys don' t get paid the $300 an hour you demand, Jaredbrain. Some attorneys doing valuable work for the state as child advocates may get less than $25 an hour. That's a shame. You really are a greedhead, aren't you? A stalwart champion of the overdog at $300 an hour.